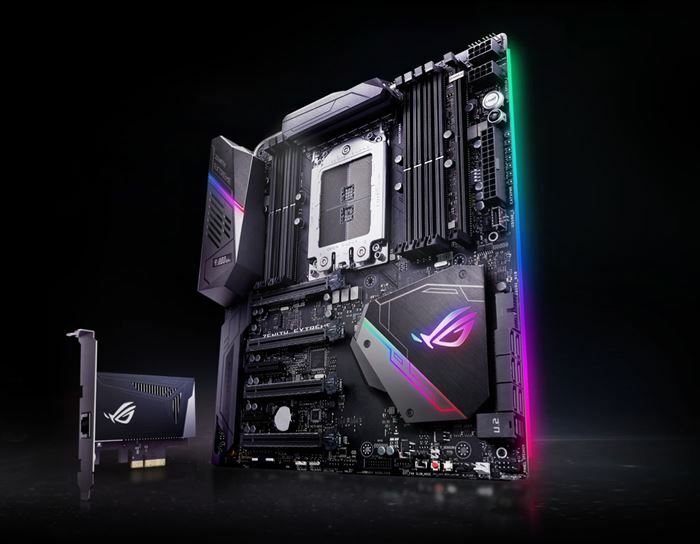 ROG Zenith Extreme includes a dedicated addressable RGB header* that connects to compatible lighting strips, fans, coolers, and compatible PC cases — all to create a new world of illumination possibilities. Aura software offers an array of effects for addressable gear, and the Aura SDK takes things to the next level — allowing developers to control each LED individually, unleashing infinite lighting possibilities! 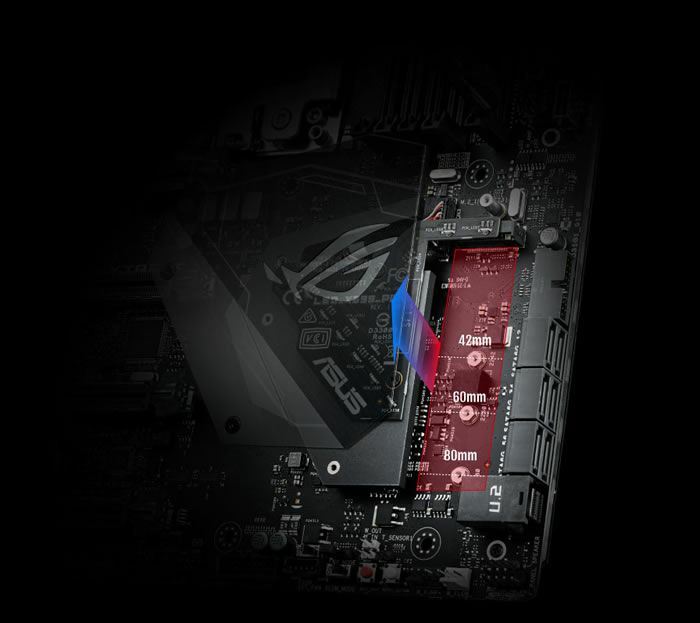 Customise your own favorite LED effects with Aura, the intuitive lighting-control software, to cast a stunning multi-color glow across your build via the ROG Zenith Extreme's brilliant built-in RGB LEDs or attached RGB strips via the two onboard 4-pin headers - all lights will perform in perfect synchronisation. Fire up Aura and enjoy the creative freedom of nine different lighting schemes! ROG Zenith Extreme comes equipped with all-new LiveDash — a built-in OLED panel that displays useful information and customisable graphics. During the power-on, self-test (POST) phase, LiveDash shows key progress stats, in simple language and via traditional POST codes. Then, during normal operation, the vibrant panel shows a choice of CPU frequency, device temperatures, fan speeds or information from the Water Cooling Zone, You're also able to customise the default LiveDash GIF, so it'll display your own image or animation. 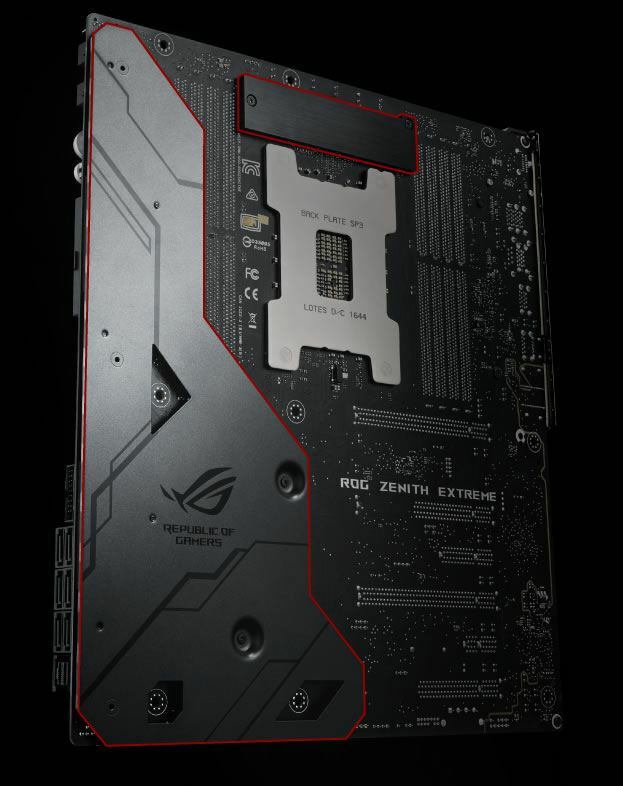 ROG Zenith Extreme's DIMM.2 module is a bundled expansion card that allows two M.2 drives to be connected via a DDR4 interface. You can then add a memory fan to direct cool air to the M.2 drives to prevent throttling, ensuring maximum performance. 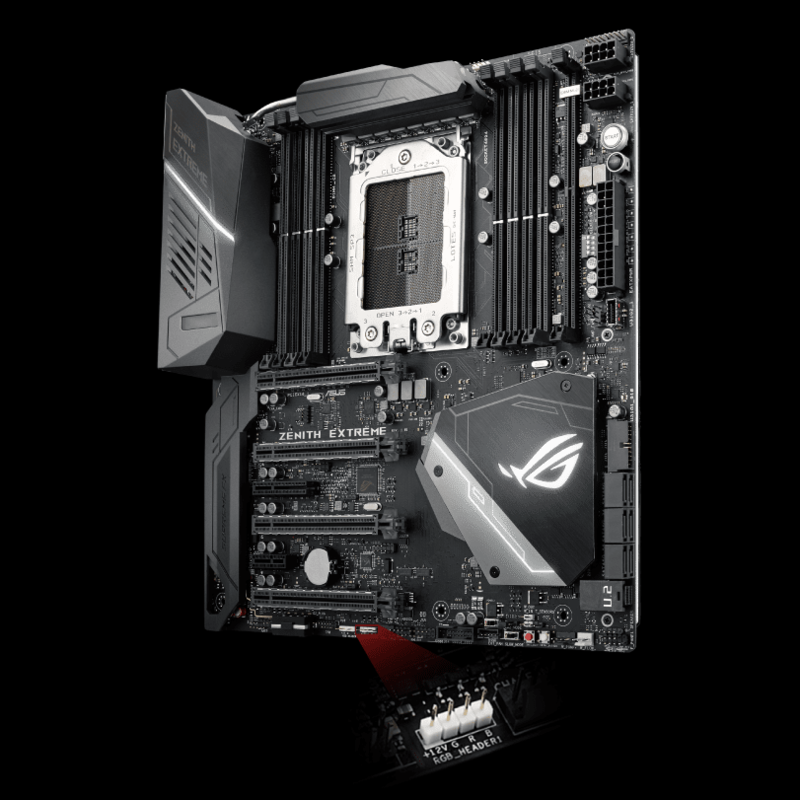 ROG Zenith Extreme is equipped with an M.2 heatsink integrated into the PCH heatsink. With a huge cooling surface, the heatsink perfectly chills an inserted M.2 SSD — for maximum performance and reliability. 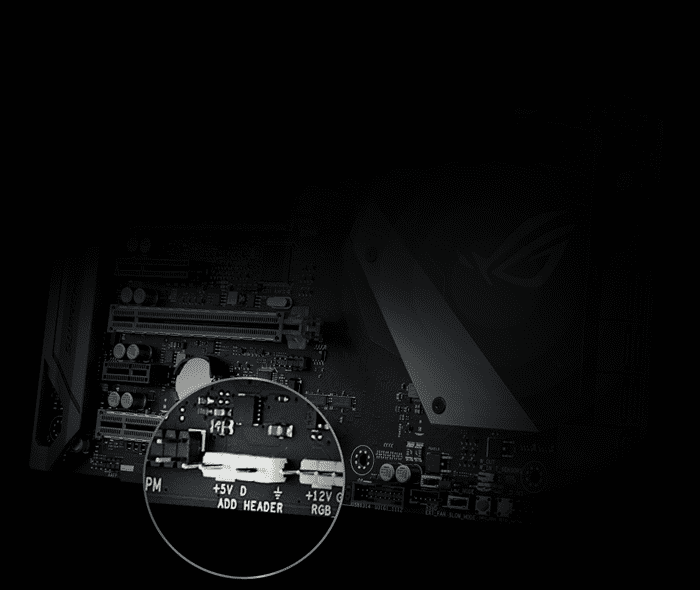 Featuring a stylish angular design replete with an awesome glowing ROG eye logo, the heatsink adds a beautiful touch to the build, while the T-sensor allows you to connect a thermal probe and monitor M.2 drive temps in real-time. ROG Zenith Extreme comes with ROG Areion, the high-performance expansion card that plugs you into the new era of 10Gbps networking! 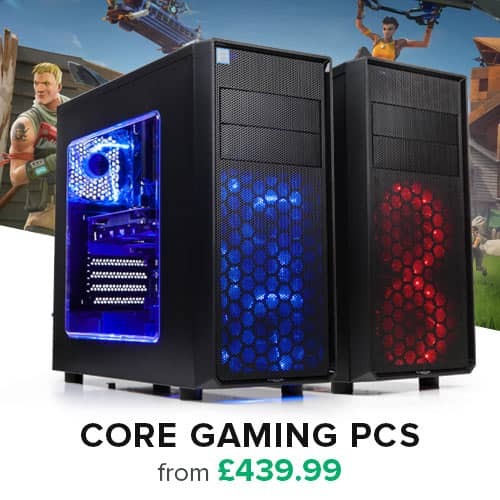 Made especially for the demanding requirements of power users, content creators, and others who push the envelope, Areion is named after the mythological horse with legendary speed. The large heatsink keeps the card cool while transferring massive files like 4K videos, and support for intermediate 2.5G and 5G connectivity lets you step up to faster networks for maximum flexibility. Choose the bandwidth that meets your needs and enjoy ultra-low latency at any speed. 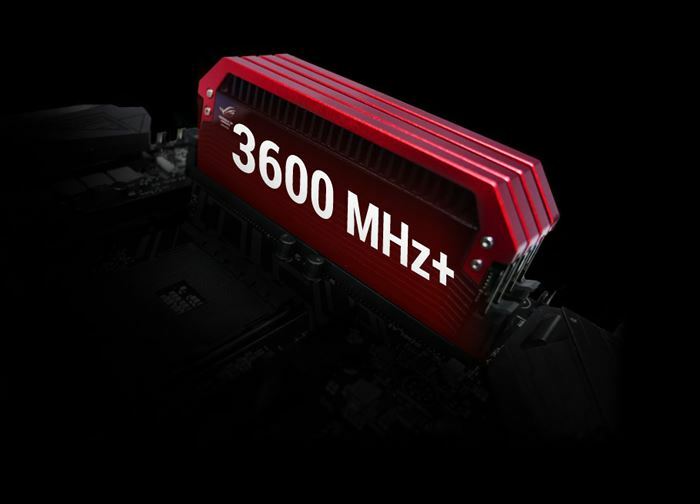 With support for DDR4 memory you're able to drive memory frequencies to 3200MHz — or beyond! ASUS-exclusive circuit design, provides superb memory-overclocking potential, minimising coupling noise and signal reflection to unleash the full power of DDR4. With innovative equidistant memory channels, the ROG design delivers the most balanced control and incredibly powerful overclocking capability. And that's not all: ROG works with almost every DDR4 memory vendor, ensuring the best compatibility. 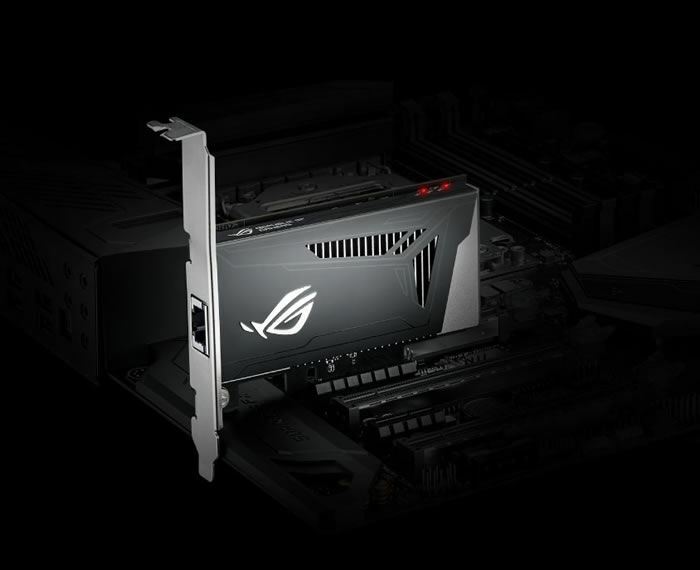 ROG Zenith Extreme is ingeniously engineered with two distinct backplates, providing both form and function. 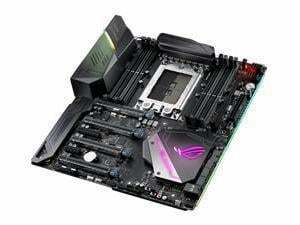 The small, strong backplate prevents the motherboard from bending and bowing, ensuring that the voltage-regulator module's MOSFETs stay in direct contact for uninterrupted cooling and stable temperatures. 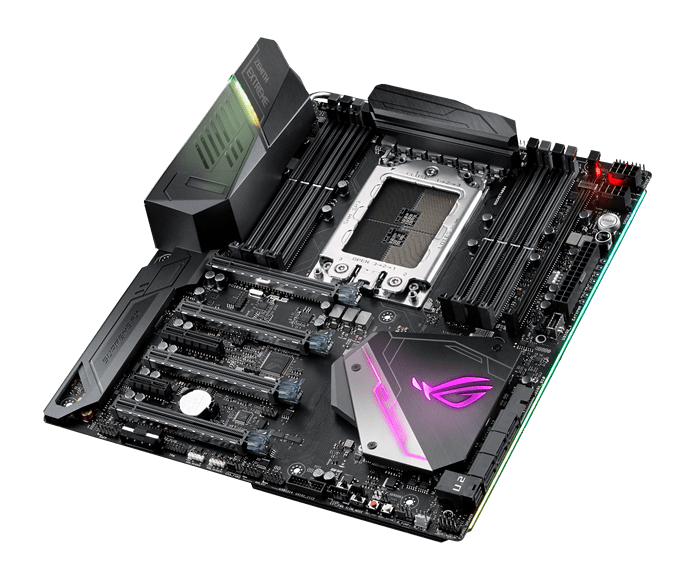 The second, larger backplate is all about aesthetics: a style statement that's as bold as ROG Zenith Extreme is powerful.